Home/CSC University/How To's/Which Clip Strip® is right for me? For Brands/Consumer Package Goods Manufacturers, the physical requirements of your package for an attractive display and the expectations of the retail operation(s) that will be displaying your strip in their stores are a summary of the considerations. For Retailers, although most Clip Strip® Merchandisers are sent in via your consumer package goods manufacturer customers, you do make independant strip purchases and you should consider some of the following when deciding which way to go. Of course, you can always ask us for guidance. Your Customer (usually the retailer) will let you know how many Clip Strip® Merchandisers with your product they are willing to accept per location. They may well suggest or request a 6, 8 or 12 products per strip configuration and whether they will require a header (a rectangular area at the top of the strip for branding via labels or screen printing), or not. Even without the retailer requesting a header, many brands still submit branded header clip strips because they look for that extra visibility in the crowded retail environment. As per a custom printed Clip Strip® Display Merchandiser, that is also an option that the retail store may welcome, expect much higher costs unless quantities are very large. The retailer will also let you know if they expect the strip to arrive pre-loaded (ready to be removed from the carton and hung by the strip hanger product, in most cases, an S-hook) or if they are willing to load the strip and/or S-hook at the store and all you would have to do is include the Clip Strip ® and/or the S-hook in your carton with your merchandise. In some cases (usually with Metal Clip Strips®), the installation of the strip is of a more "permanent" nature and either the store employees, you or someone you hire (like a Distributor or Field Reset Company) will be responsible for maintaining stock on the clip strip. Many people contact Clip Strip Corp. asking if we carry a “12-position strip.” We of course say “we do” and they reply, “Fine, how much would 1,000 of them cost me?” Unfortunately, the selection of the “right display strip” is a bit more involved than that. Thickness: Is the thickness uniform or does it vary? If it varies, where is it the thickest (usually at the bottom)? 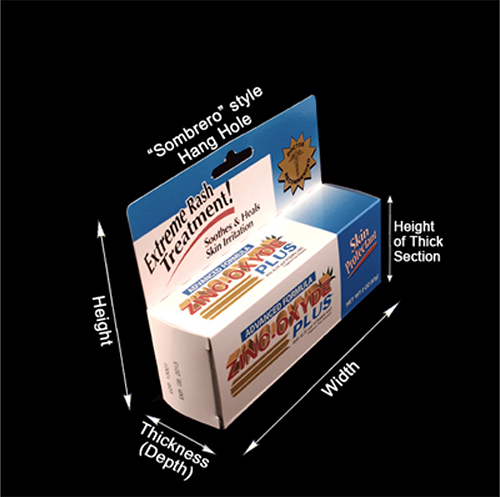 The dimensions of the thick and the thin part of the package. Hang Hole: Does your package have a hole to hang it off a clip strip or peghook? Type of Packaging: Blister Pack, Polybag with a fold-over header, Clamshell, Cardstock, etc. No Packaging: sometimes there is no packaging. It could be a tube of sun-block cream or a bottle of lens cleaning solution, etc. In these types of situations a custom clip strip may be required (such as a “bandoleer” strip) or hang tabs in combination with a standard strip may be the best solution. We also carry a newer innovation for these types of scenarios, the Sticky Strip™ Merchandising Strip, a display strip that has adhesive based mounting positions (no hooks) and is a great fit for packaging without hang holes. Where it will be Displayed: This is another key factor in deciding which strip and or strip hanger is right for you. Will it be able to hang with a simple S-Hook, does it require being merchandised in a flag or aisle violator position and/or does it display off some other type of retail display fixture solution requiring a less common hanger? Such as on a glass door where it may need a suction cup or specially designed display strip door hanger. Is it going to be displayed in a very busy aisle, a possibly rough envionment? Having the above information available to share with us can be invaluable in helping select the best strip solution for your needs. Unless there is simply no time available, we will send you free samples of our selected strip(s) for your evaluation (free of charge). You can also send us samples of your packaged merchandise for testing at our facilities. Either way, it is important that the clip strip® and its corresponding product being displayed are tested together prior to shipment to stores. Thus, everyone avoids the embarrassment of product falling to the floor or an unattractive display that may in fact, turn buyers away from your products and detract from the look that the retailer wishes to project to its customers. For those who need it, we can also offer some guidance with regard to how to load strips properly, finding the right carton and other packaging materials/techniques to help your clip strip® program be successful! And, it's important to keep in mind, Clip Strip Corp. provides affordable, professional and complete fulifillment/kitting services taking that headache away from you. Any more questions? We are glad to help! Contact Us via our Online Form or call Toll Free at 1-800-4-CLIP-STRIP (800-425-4778).